Millennium Jet Inc. CEO Michael Moshier pilots the Solotrek XFV during a demonstration in December. (BubbaSoft) -- It may only hover a few feet above the Earth right now, but the inventor of the SoloTrek XFV hopes that one day it will allow people to swoop and dive at distances comparable to a small airplane. 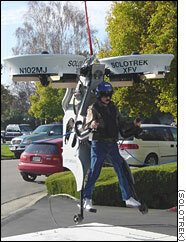 But unlike a plane, the SoloTrek "jetpack" is being designed to land on a dime with more maneuverability than a helicopter. California-based Millennium Jet is the company behind the SoloTrek, which is still in the research and development phase. The 325-pound machine uses a combination of ducted fans, an internal combustion engine, computer codes and onboard electronics to provide its lift. By adjusting the SoloTrek's handles, a standing pilot is able to guide the direction and altitude of the machine. It runs for about two hours on a tank of gas or heavy fuel such as kerosene. Michael Moshier, chief executive officer of Millennium Jet, says he came up with the idea while doodling on a napkin about five years ago. A few years later the company broke its secrecy, and this past December Moshier managed to pilot the SoloTrek to a height of about two feet while protected by a safety tether. Admittedly, Moshier says the height sounds minimal, but he says it was important in demonstrating how it could eventually work. He says he was only willing to test it at a height from which he didn't mind falling. And what if the engine quit when a pilot is much higher in the air? Moshier says a rocket-propelled parachute or ejection seat will be part of the SoloTrek. Pilots would also wear helmets and be protected from inclement weather. After college, Moshier himself served for six years as a U.S. Navy officer, including a stint as a jet aircraft combat pilot during the Vietnam War. Although Moshier says the SoloTrek is currently too unstable to reach higher speeds or altitudes, the company is redesigning the control system to balance and harness its power. According to Millennium Jet's computer models, SoloTrek will eventually be able to fly at altitudes of nearly 8,000 feet for about 120 nautical miles and reach speeds up to 80 mph. It will be primarily sold to the military, and later aimed at police, fire departments and search and rescue teams. Ultimately, it may one day reach the civilian market. This summer, Moshier hopes to demonstrate a more advanced prototype, and by 2003 he says he plans to make a functioning unit available to the U.S. Special Forces. Initially a solely self-funded venture, Moshier says he also has received resources and technical advice from NASA and a sizable chunk of funding from the U.S. Defense Department. To date, he says nearly $3 million has been spent on the prototype. But despite the high cost, it's a passion for Moshier, who says he's "always dreamed of being able to fly." Daniel Llewallyn, BubbaSoft Sci-Tech Guru and Vice President in charge of Development Engineering.